Great hair is a combination of proper nutrition, care, maintenance and a balanced lifestyle. Blend all these factors nicely together and you have a hairline to die for. Your hair needs a good supply of vitamins and minerals to stay healthy. 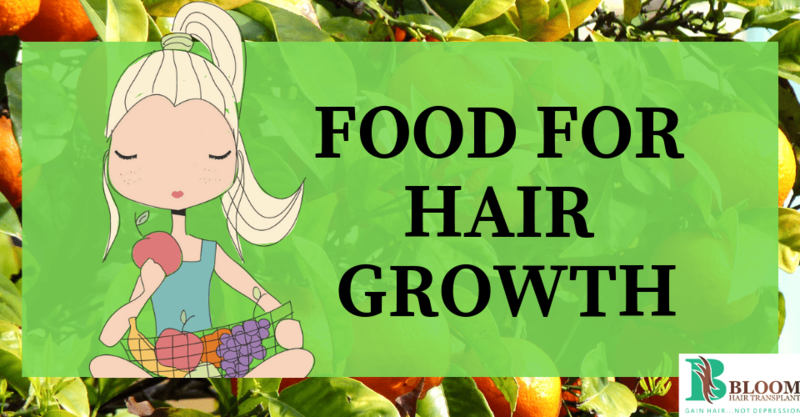 In this blog, we will focus on nutrition and food intake that can have a direct, positive affect on your hair growth. Here are a 6 simple food items that you should consider as part of your diet, to be able to enhance your hair growth, volume and texture. The single-most component that promotes healthy hair is Keratin, a form a protein. You must include food items that are a rich source of protein. A major dip in the protein levels can result in hair loss, which is why we recommend that you have your daily intake of protein in proper portions. Foods such as eggs, chicken, milk and dairy products, legumes and leafy vegetables, are excellent source of protein that your hair needs. Biotin is a key vitamin that plays a pivotal role in hair growth. It is proven to reduce thinning of hair and discoloration. Biotin supplements can give you that thick, lustrous hair that you seek. Biotin is often found in foods such as liver, egg yolks, berries and soya. A lot of over-the-counter biotin supplements are also available at local drug stores. Daily multivitamins are a good for promoting hair growth and for maintaining good texture. Foods rich in Vitamin C is very useful in the production of collagen, a key component for hair and tissue growth. It also promotes blood supply to the scalp. Vitamin C is found abundantly in citrus fruits such as lemons and oranges, berries, sweet potatoes and so on. Vitamin E widely found in most skin-care products is important for tissue repair. Food items rich in Vitamin E, such as almonds, olive oil, avocadoes and spinach, should be part of your daily intake. Vitamin A promotes Sebum, a natural conditioner, produces by the body. It is critical to keeping the scalp healthy and infection free. Carrots, beets, vegetables, apricots and pumpkins are rich in Vitamin A. Fish is a rich source of Omega-3 fatty acids, a component that promotes hydration of your hair, prevents breakage and thinning, and produces new and thick hair follicles. It is an essential arrow in your quiver and the one that the body needs on a daily basis. An important mineral, Iron, ensures that your hair is replenished with oxygen. Anemia, a condition where the body is deprived of iron, can cause serious hair loss and damage. Good scalp requires a constant blood supply, rich in iron. Hair follicles remain healthy and grow quickly, in such an environment. Consider adding seafood, meat, chicken, apples and soyabean to your diet for your daily iron intake. About 25% of a follicle’s weight is made up of water. Therefore, water intake is crucial to follicle growth. Staying hydrated and drinking enough water provides the adequate number of vitamins that your scalp needs. Experts recommend two to three liters of water daily. To know more about hair growth, simply contact Bloom Hair Transplant today.